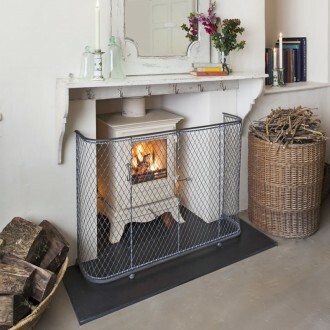 Fireguards are an essential addition for stoves and fires that are exposed to small children or animals. However, most fireguards for sale today fail to do the most basic job intended of them as many are folding fireguards, rendering them useless and far too flimsy to be called a guard. Weaving wire to create a sturdy fireguard is a skill that’s been revived by Garden Requisites. We’ve been overwhelmed by the response from our customers who tell us that they’re so relieved to find a fireguard that is actually fit for purpose. An added bonus is the option of wall fixings to ensure that the fireguard can be securely fixed to the wall if necessary. Made to measure fireguards and bespoke fireguards can also be made to fit your dimensions.